SHAMVA, Zimbabwe, Oct 26 2015 (IPS) - Last season, Mollene Kachambwa lost a tonne of the 5 tonnes of maize the family harvested to weevils and fungi. This season, weevils and fungi have to find a new host. 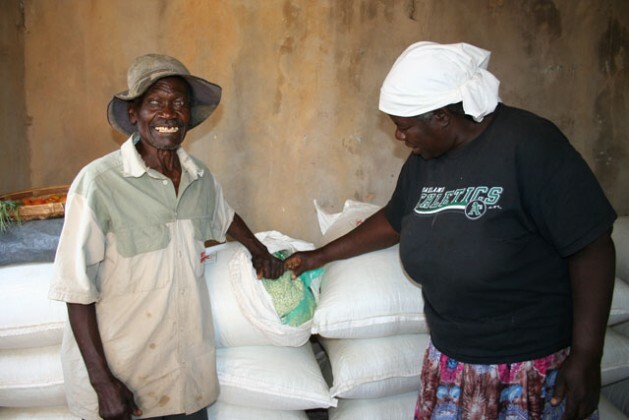 Kachambwa, who is from the Kachambwa village located 75 km north east of Zimbabwe’s capital Harare, has stored her maize harvest in an airtight galvanised metal silo. This is a shift from using traditional granaries or polythene sacks, which are not insect and fungi proof. Certain fungi produce a chemical toxin known as aflatoxins, which can infest maize grain both in the field and subsequently in storage. Tests in Zimbabwe have found significant levels of contamination in maize crops, and the toxin can also infect other crops, notably legumes such as groundnuts. Aflatoxin exposure – a growing food and health risk in Africa – has been linked to weakened immunity and cancer risk. Young children are at risk of stunting, and even babies are susceptible to aflatoxins carried in their mothers’ milk. Farmers like Kachambwa spend on average more than 50 dollars each season on pesticides to protect their grain from weevil damage, but they have little protection against contamination from fungi. Given the high farming input costs in Zimbabwe’s struggling economy, farmers worry about storage and safety of their harvest. The prospect of pesticide-free and hassle-free grain storage methods at affordable cost is irresistible. Researchers in Zimbabwe are investigating aflatoxin exposure among maize farmers and ways to reduce it under a 30 month project involving 12 wards in the Shamva and Makoni Districts. The project is being implemented by Action Contre la Faim and the Institute of Food, Nutrition and Family Sciences at the University of Zimbabwe in partnership with the government of Zimbabwe. It is investigating the effectiveness of airtight metal silos and thick plastic “super bags” in reducing aflatoxin contamination in maize grain and assessing the exposure of women and children to the deadly toxin. Levels of aflatoxins are being determined in legumes (bambara nuts, ground nuts, cowpeas and sugar beans) from farmers. Farmer, Alice Mhonda from Mushowani village, who last season harvested 2 tonnes of maize, has stored it in hermetic bags neatly stacked on log frames in a room outside her kitchen. Farming households who consume their own maize for more than six months each year, including breast feeding and pregnant women and children under 5 years of age, were selected to take part in the study. Mothers and their children are giving biological samples (blood, urine and breast milk) in addition to grain samples being taken for laboratory analysis on a regular basis. Baseline laboratory results on maize and legumes as well as on biological samples are expected by end of November 2015 to determine if farmers have been consuming aflatoxin contaminated grain. Increasingly high temperatures in Zimbabwe and droughts linked to climate change increase the vulnerability of maize grain and legumes to aflatoxin contamination. Poor drying and storage methods used by farmers after harvesting also contribute to the exposure to the toxins, said Ozwell Chitono, an agriculture extension worker who serves farmers in three enumeration areas Ward 5 of Shamwa District. “Farmers had a problem storing the maize, which was affected seriously by the Large Grain Borer, And the hermetic bags and the metal silos are effective methods according to the farmers, as most of them were not aware of the aflatoxins and would feed contaminated grain to chickens and goats,” Chitono said. Nutritional biochemist and project coordinator under the University of Zimbabwe, Dr. Cathrine Chidewe, tells IPS that aflatoxin contamination is a big issue that is not being taken seriously in Zimbabwe because of ignorance and limited research. She said the intervention study will provide evidence that could enhance the national policy on aflatoxin testing in the country and make airtight storage, a model for post harvest management in the country. Food safety and quality as a result of aflatoxin contamination are a growing concern to improving food and nutrition security and agriculture productivity in Africa in line with the recently agreed Sustainable Development Goals. According to the Food and Agriculture Organisation (FAO) of the United Nations, 25 percent of world food crops are affected by aflatoxin contamination. The US Centers for Disease Control (CDC) estimates that more than 4.5 billion people in the developing world are exposed to aflatoxins, while research by the International Food Policy Research Institute (IFPRI) suggests that an estimated 26,000 Africans south of the Sahara die annually of liver cancer associated with chronic aflatoxin exposure. “Food quality and safety issues resulting from aflatoxin contamination present a serious obstacle to improving nutrition, enhancing agricultural production and linking smallholder farmers to markets,” says a report by the African Agricultural Technology Foundation (AAT), which is coordinating the Aflatoxin Control in Maize and Peanuts project. The project seeks to reduce aflatoxin contamination and improve food production in sub-Saharan Africa. The metal storage bins, while a welcome novelty in Kachambwa village, they have boosted business for tin smith Francis Pokoti, who was trained under the project to make the metal silos. “I have made more than 100 metal bins of various sizes for the project and for other customers who are trying the bins,” said Pokoti who operates a roadside shop in Wadzanai business centre in Shamva District.